Overlockers, also known as sergers, were originally used for industrial sewing. However, thanks to advancements in technology that allowed for lighter and more compact sewing machines, these units can now be found in many homes. 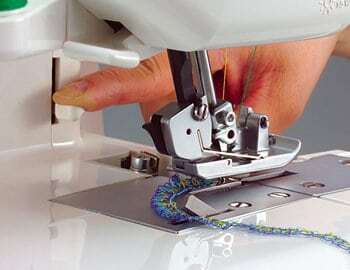 Overlockers provide several advantages that you won’t find in conventional sewing machines. Not only are overlockers faster and more efficient, they also enable you to cut excess seam allowance as you sew, saving you the hassle of using a scissors or other cutting aids. In addition, overlockers are cost-saving machines that will allow you to mend clothes easily. 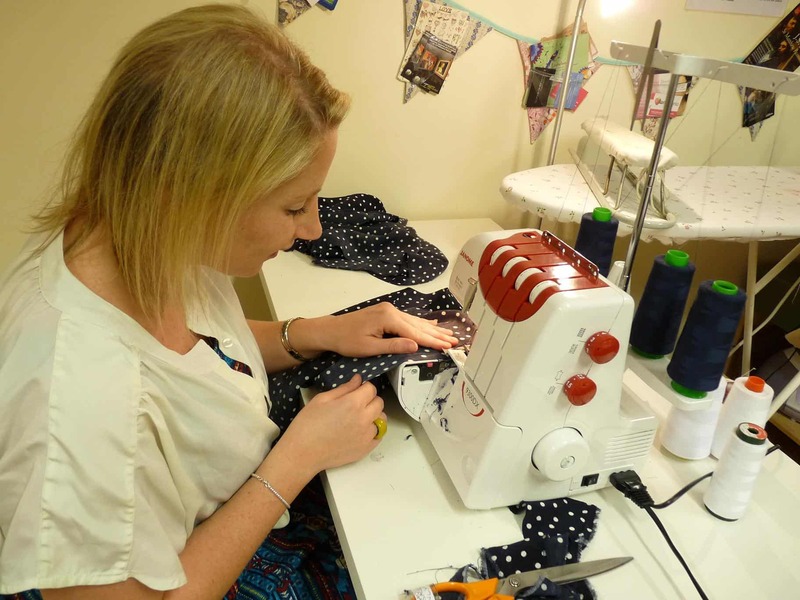 What Does an Overlocker Sewing Machine Do? The main role of an overlocker sewing machine is to overcast or sew over and enclose the raw edges of fabric. When you use an overlocker to sew, the machine creates neat seams like those found on store bought clothes. Additionally, overlock stitches not only finish the edges but also prevent seams from unraveling into an untidy mess. Most overlockers come with a built-in knife blade that cuts excess seam allowance as the machine sews. As such, sewing professionally-finished seams becomes an easy and quick one-step process. That being said, these machines have many other uses besides finishing fabric edges. You can use these machines for decorative edging, creating cover stitches, flatlock sewing, attaching elastic, or sewing woven fabrics too. If you’ve ever used a conventional sewing machine, you must be wondering whether operating an overlocker will be a similar experience. The answer to this is yes and no, because there are both similarities and a few differences between these two types of sewing machines. For example, an overlocker provides the option to adjust stitch length with the help of dials just like what you would find on a mechanical sewing machine. Both machines also work with a foot pedal, although some electronic sewing machines are button controlled instead. In order to use an overlock sewing machine, you’ll have to thread it first. Threading is perhaps the most challenging aspect when it comes to using this versatile machine since it can use 2 to 5 spools of thread all at once. The use of multiple threads is quite different from what most sewers are used to when using a typical sewing machine. After threading, the next step is learning how to use the different functions on an overlocker. For instance, the cutting blade can be lifted to disengage it when embellishing edges that do not require cutting of excess seam allowance. What’s more, you’ll need to learn how to adjust thread tension, differential feed and stitch cutting width. Fortunately, most of these features can be engaged at the turn of a dial or with sliders that come as part of the operation controls found on an overlocker. Generally, overlockers can use up to 5 cones of thread simultaneously. However, 4-thread models are the most common. The spools of thread these machines use will pass through an upper and lower looper as well as two needle guides. Threading begins with raising the telescopic thread bar and inserting your first cone on the appropriate spindle holder. Once that’s done, every spool of thread will go through a loop on the telescopic thread bar, under a hook on the top edge of the machine, through the grooved channel, and then between the tension control discs at the front. Past the tension discs, every spool of thread goes through somewhat different paths. For example, the upper and lower loopers continue downward on the next part of the grooved channel then into a thread guide. These spools go through a series of hooks and attachment points inside the hand wheel, which are mostly color coded for easy threading. In the next phase, the needle spools pass under a hook and two thread guides just above the needle area. Finally, all thread tails pass under the presser foot and onto the side or back of the throat plate. Threading an overlock sewing machine may sound complex but most models provide detailed diagrams to make the process easier. Furthermore, some machines are even color coded to help you know where each spool of thread goes. How to Choose a Good Overlocker? While there are many overlock sewing machine brands to choose from, it’s always wise to settle for a reputable manufacturer. At some point, you might want to replace a broken part or buy new accessories, and respected brands are known to provide high quality units along with reliable after sale support. Among the many choices that are available, some of the more well-known brands include Brother, Singer, Janome, Babylock, Elna, Bernia, Husqvarna, Juki and Pfaff. Overlock sewing machines are not all created equal. Some models are built to last while other cheaper ones break easily. If you want a machine that will provide you with years of service, be sure to select models built with metal components inside. Metal parts last longer and add weight to the machine so that it remains stable during use. As mentioned earlier, overlock sewing machines use 2 to 5 threads in one go. However, the number of thread spools any overlocker uses ultimately depends on the chosen model. The more threads a particular model comes with, the more it will cost. When thinking about how many thread spools you want in your unit, don’t just consider the cost. With a 2-thread overlocker, you can only create elementary edges while a 3-thread setup will prevent seams from fraying. For more decorative work, consider using an overlocker that sews four or even five strands. While 5-thread overlockers are the most expensive, they’re also the most versatile. When shopping for an overlock sewing machine, you’ll come across many models that claim to offer differential feeds. Machines with this feature are equipped with two sets of feed dogs that can regulate how fast or slow fabric moves through the needle area. 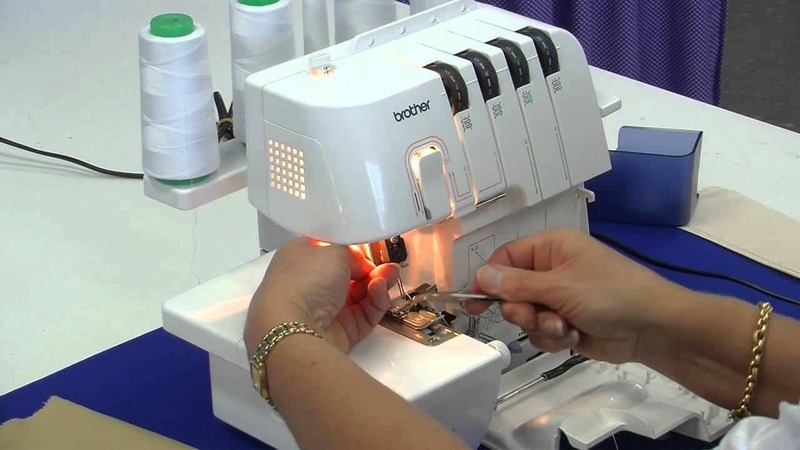 Differential feed is a great feature if you want to use an overlocker on various materials. For instance, the differential ratio for stretchy fabric will be different from that of woven materials. What’s more, different results can be achieved when you have the freedom to manipulate how fast or slow fabric is pulled. For example, you can create a wave-like effect or “lettuce edges” when sewing seams as fabric moves quickly through the feed dogs. The free arm basically reduces the work surface area of the throat plate when a portion of the base is removed. This feature is useful when you need to sew small, curved areas of a garment such as cuffs, collars, and sleeve holes. An added bonus to look for is the hollow storage compartment in the free arm attachment area, which comes with some overlockers. This feature will allow you to store all your accessories in one place. Compared to the average speed of 800 stitches per minute (SPM) that most conventional sewing machines operate at, overlockers are generally much faster when it comes to sewing. For instance, entry-level overlockers can provide speeds of up to 1300 stitches per minute. You may also notice that some manufactures specify the speed in revolutions per minute (RPM). This is because most overlockers have to complete one revolution for every stitch they create. So, do not get confused as SPM and RPM mean the same thing. Remember that a faster overlocker will complete tasks more quickly than a slower one. The only caveat with fast overlockers is that they cost more. However, a fast unit is well worth it if you work on bulk sewing projects. Does the device come with simple to use dials for adjusting stitch length, cutting width, and differential feed? Is there a color-coded threading guide to help you thread with ease? If your machine has rolled hemming capability, do you have to go through the hassle of adding a special plate or turn a dial to make the conversion? Are the dials on the machine clearly labeled? Does your chosen model include a bulb to illuminate the work area in low light conditions? Can the presser foot be easily snapped on and off or must you screw it into place? Does the unit have a built-in cutter or will you have to trim excess seam allowance manually? 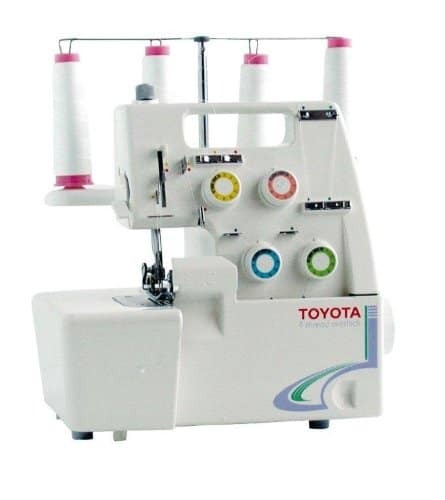 It’s common for manufacturers to offer overlock sewing machines along with accessories in one bundle. For instance, your overlocker may come with extra tools such as accessory feet, a carrying case, dust cover, spool nets, spool caps, tweezers, stabilizing mat, elastic gathering attachment or pad and trim catcher. Some brands will offer fewer while others provide more accessories at no additional cost. Therefore, always make sure to find out what is in the box before buying. How much you’re willing to spend on an overlocker plays an important role in the final choice that you’ll make. Entry-level units can go for as little as £100 or less while high-end machines can cost several thousand pounds. As with most items, the more you spend, the more features you get. It’s important to point out, though, that the most expensive overlockers are not always the best. Sometimes you pay extra for the brand name or extravagant features that you’ll never use. To make an informed decision, make a list of all the features you would like in an overlocker and then shop around. Visit different sellers both online and at physical stores in your location, and be sure to read customer reviews on the web and compare prices and features for different brands that match your preferences. Once you establish the price range for your preferred overlocker, select one that offers the best value for money. If you’re on a tight budget, consider buying a used serger from a trusted source. If the seller allows buyers to test the machine before buying it, that will be even better. The only drawback with buying a used machine is that it might not come with a warranty. With all the numerous brands that are on the market, it can be intimidating to choose the best overlocker. However, knowing what to look for makes the selection process easier.